If our lives are measured by how much we give, Michael Jackson is already miles ahead of most people. Growing up, instead of birthday presents he would ask for books and donate them to a Minneapolis Children's Hospital library. At age 11, he established a website to raise money for the Starlight Children's Foundation — an organization that supports seriously ill children and their families. And, two years ago as a freshman at St. Scholastica, he was awarded $25,000 for the charity of his choice through the NASCAR Foundation's Betty Jane France Humanitarian Award. He chose Starlight Children's Foundation. 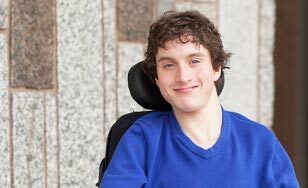 Born with cerebral palsy that severely limits the motion of his arms and legs, Jackson has benefited from the organization — particularly through their Starbright World social network for chronically ill kids and teens, where he is now a community leader. But Jackson is nowhere near done making a difference. He has since championed another cause, the Essentia Health Foundation's Legacy of Hope — a dinner, auction and golf tournament fundraiser for the Essentia Children's Hospital. The proceeds of the 2014 event went toward the creation of a solarium at the hospital decked with big screen TVs, video games and computers. This room provides patients an escape from their medical issues — something that Jackson knows about personally after having more than 70 surgeries. "It can get pretty lonely and boring in the hospital, so having a room like the solarium is very important," Jackson said. "To just be able to leave your room and experience normal life by watching a movie on the big screen or playing some video games with your family and friends is very important." And soon, children and teens will be able to do just that, as the event raised over $250,000 this past August — far surpassing the goal of $200,000. As the honorary chairman of the Legacy of Hope fundraising committee, he spent and continues to spend much of his time trying to lure sponsors and spread the word about the event, which has made it difficult for Jackson to get too involved on campus outside of his double major in psychology and computer science/computer information systems and winning the 2013 CSS talent show with his "sit down comedy." "Scholastica means a lot to me," Jackson said. "I feel like we're given so much here from the community, the school, the students, the people who work here, and I think it's important to show our appreciation by giving back to the school in some way — whether that's volunteering or joining a club or helping to make a difference. That's what makes the world a better place to be." That and people like Michael Jackson.